Today I am reviewing Catholics Come Home: God's Extraordinary Plan for Your Life, by Tom Peterson. This book had been on my wish list for some time, and when I saw it I knew that I wanted to select it for immediate reading. By the title, I thought the book was a collection of conversion stories of people either reverting back to their childhood Catholic faith or converting to the Church from another faith or utter lack thereof. In fact, though, that is not what the book is about at all. The author, Tom Peterson, does talk about his own experience of reverting back to his Catholic faith after drifting away as a young adult, but the rest of the book is devoted to suggestions and words of wisdom toward bringing others home to the Catholic Church. Mr. Peterson is the founder of a nonprofit evangelization organization (under the same name as the title of this book), and thus has a lot to offer on this topic based upon his work. 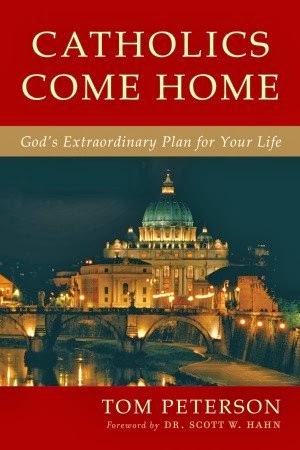 I also liked the author's very heartfelt suggestions for relating to loved ones, and even strangers, who are away from their faith and sometimes need just a small nudge, whether that be an invitation to attend Mass with you, or a kind word, or an understanding ear, to begin exploring their relationship with God again. He writes about meeting a beleaguered flight attendant one day, and I think all of us can relate to a person just doing her job who is having an extraordinarily difficult day due to circumstances completely outside of her control. Simply going out of his way to be extra kind to her in the face of the uncharitable treatment of others, combined with handing her a card from his organization with a personal and uplifting message written on the back...you will not believe what happens next, and what the flight attendant's personal faith story is. Read the book to find out! I absolutely loved Mr. Peterson's recommendation to pray for those who have drifted away from the Church during the moment of consecration of the Precious Blood during Mass. We can use that opportunity to intercede for these loved ones while reflecting on how Christ poured out His blood for the salvation of mankind. Beautiful words, and soothing to the soul of those who, in a similar vein to St. Monica, are praying for someone very dear to them who are currently apart from Christ and His Church. This book also includes an *excellent* appendix of recommended reading, prayers, and related organizations for those who are personally invested in this topic. The appendix alone is worth the price of the book for an outstanding spiritual reading list. This book is what I call a "quick read," at only 156 pages and fairly compact in size. For what the author aims to do, however, more is not needed. The information within is quite good. I do wish that the book had chapter titles on the top of each page rather than the book title, so that one can more easily keep track of where they are when they set the book aside and come back to it. That is obviously a very minor criticism, but I found it troublesome. If you are looking to become a prayer warrior and lay missionary for lapsed Catholics and others to come back to their faith, I do recommend this book. You may read Chapter 1 here for free. If you found my review enlightening, please do visit the Blogging for Books page to search for and rank my review!